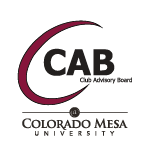 Club Advisory Board | Colorado Mesa Univ. The Club Advisory Board (CAB) is responsible for the establishment of new clubs and the allocation of monies to registered clubs. CAB is also an information center for any student interested in becoming involved in one of our clubs and organizations. There is something for almost everyone, and if there isn't a club that fits your interests, CAB has the resources to help such students get their own club started and a jump-start fund of $50. All members attend quarterly meetings in which clubs may request a portion of funding from student fees to help fund their activities. CAB can also assist clubs with advertising, event planning, and travel arrangements. CAB is located in the University Center, on the 2nd floor, at the front desk of the Student Life Office. Office hours are from 8-5pm, Monday - Friday. Every Fall Student Life and CAB hosts a Club and Activities Fair to promote all of the CMU clubs and organizations. This year it will be held on August 28th, 2018 from 11am-2pm on the Plaza (west of UC). In order to request table space please Sign up Here. The easiest way to get involved and stay connected on campus is with OrgSync! OrgSync brings all of the 100+ student clubs and organizations together in one convenient location. OrgSync serves as the hub for all of the paperwork processes for clubs and organizations, as well as the primary location for students to explore all of the events on campus and connect with any club or organization. Login and check it out!